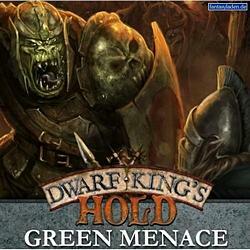 The second game in the acclaimed Dwarf King’s Hold series. This standalone 2-player board game pits the Elves versus the Orcs as both sides ransack the ancient Dwarven Hold: the Elves reclaiming their stolen treasures and the Orcs looting the delapidated Dwarfen Halls. This excellent game contains all-new 6 scenarios and new rules for the Elves and Orcs, as well as new actions such as shooting. Included in this board game are over 25 plastic fantasy miniatures and lots of little extras that are fully useable within the game, such as the Elven Cat, plus plenty of fun conversion bits. There are also a huge pile of fantastic looking dungeon tiles that show-off the overrun Dwarfen Hold; an exciting ruleset, loads of in-game action counters and more than enough dice to play.